Unknown names, catalogue names, nomen nudum, nomen prov. etc. If you recognize any taxon or if you know further information about the names listed below, please, send me an e-mail to the following address escobaria@atlas.cz . This year I found this Escobaria (hopefully) about 100 km East of Monterrey in Nuevo Leon on plain land. Can anyone tell me what it is exactly? I have already had many trips to Mexico and this year I found this Escobaria (hopefully) about 100 km East of Monterrey in Nuevo Leon on plain land. It has RED fruits and very small bright brown seeds. 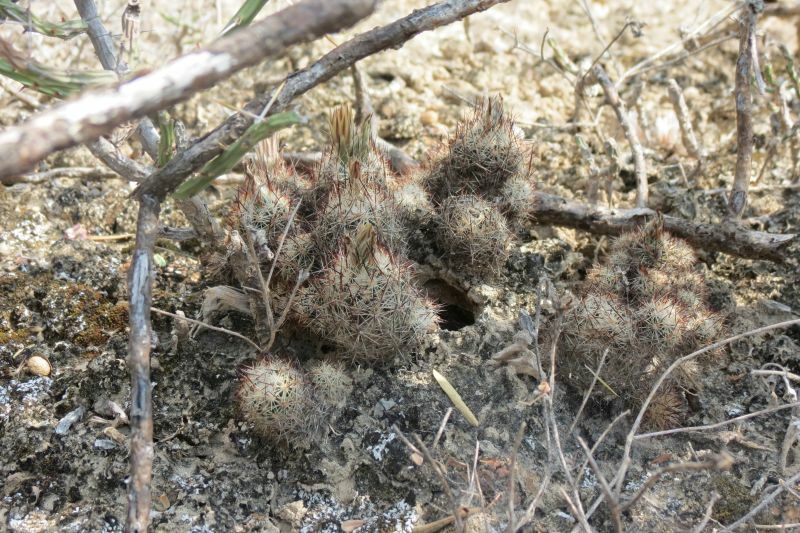 The plant is about 1,5-2,5 cm in diameter and up to 5 cm tall forming groups. Escobaria spec. - Monterrey, Nuevo León, Mexico. I think that it is a taxon of Escobaria emskoetteriana (aff. syn. 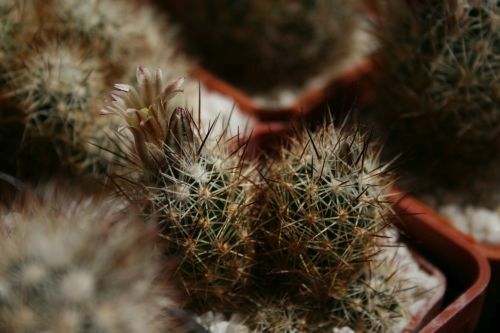 E. runyonii). I attach a photo of the plant CH 507 (Marin crossroads, Nuevo León, Mexico, 395 m.n.m.) from my collection. I also said that this plant is emskoetteriana. Typical and unmistakable plant - E. runyonii / E. emskoetteriana. What I know, it grows everywhere in Canons along hwy Mex 40, Saltillo - Monterrey and then north around on hundreds places. Common type. Spination is variable, flowers and fruits are characteristic and easily recognizable. This is a Esc. emskoetteriana, both in appearance as well as the location. A photo with a higher resolution would be good for an accurate determination. Many thanks for your opinion. Another enthusiast said it was E. robertii. I understand that is the same group. I found 2 different plants at Bustamante, NL. One with longer, brown spines, the plants were more soliter, smaller, the other one had yellow/white spination, more groupforming, bigger plants. In cultivation they do NOT flower at the same time. I know emskoetteriana and runyonii is in the same group (these are the 2 Escobarias fitting the fenotype from field number database from Bustamante - obviouly chaffeyi is different). What do you think about it? The name Escobaria robertii is invalid. It has formed from the synonym Coryphantha robertii for Escobaria runyonii. Currently the E. runyonii, E. muehlbaueriana and E. bella taxa are classified as synonyms for the name E. emskoetteriana - see, for example Lodé (2015); Charles, Hunt, Taylor (2006) or Anderson (2001). 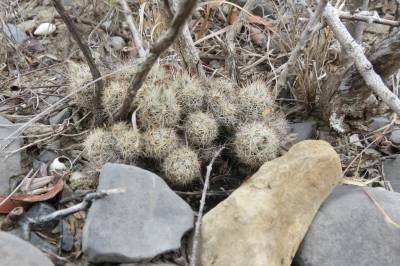 The plants are very variable in size from the stem, the color of spines and flowers. You can grow rare solitary, often branching (at base of stem) or growing in clusters. Contributions to individual taxa send please to the following e-mail address escobaria@atlas.cz . A form to create a new discussion page - new discussion .